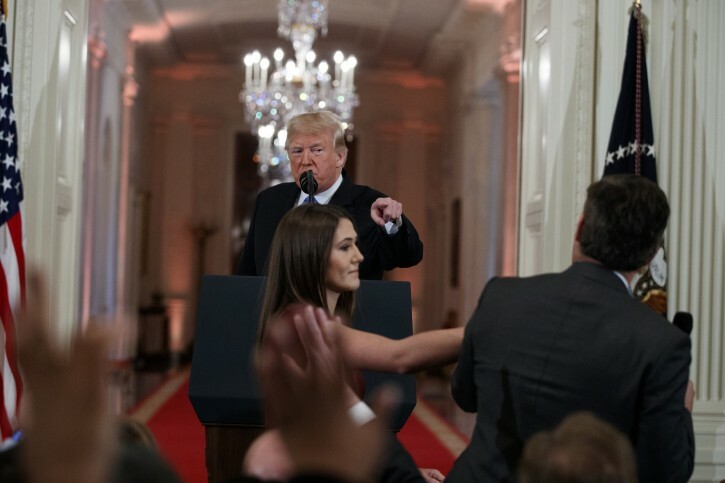 Washington - An independent video producer tells The Associated Press a video tweeted by the White House on an interaction between CNN reporter Jim Acosta and a White House intern appears to have been manipulated to make the reporter’s actions look more aggressive. Don the Con. What a lowlife. Huckabee Sanders must resign. She lacks all credibility. She will say anything to please Don the Con. Fake news ad white noise to distract. I saw the press conference live. No alterations. I was shocked. Is it assault to simply push someone's hand away ? Who knows? But no one is arresting him for assault We all agree his behavior breached on assault and was unbefitting. The press pass is a privilege. This is the highest office. Even his belligerent tone against the president or Sanders is wrong. This was just overboard. Glad the fake news always finds a nice spin to skirt the issue. “ Don the Con. What a lowlife. Don the Con is a good nickname for the putz. I was shocked to see how rude someone could be in front of a president if this would happen in any other country he would be thrown out immediately then cnn makes trump look like the bad guy the media doesn’t have an ounce of respect !!! If you have no respect for the president, you do not belong in the white house. He may not have done anything illegal or enough to be arrested, but certainly enough to be thrown out. Obama threw out hecklers too. “ Don the Con is a good nickname for the putz. He’s i the only person we know politics that contains himself so well after wht the media does to him on a Daily basis anyone els let it be Obama Clinton wouldn’t be able to handle this even for one week so think about it before commenting. You’re a nut. You support the evil obumer and dem-o-rats who are anti American anti religion. You support violent raciest hateful mobs. Like ATIFA which should be labeled a terrorist group. Acosta to the accoster, keep your hands to yourself and off women. Shut your mouth big talker . You are the con posting under ten user names . Let’s try to explain to you what you clearly are too stupid to have understood. Republicans gained seats in the senate! That’s a great thing. The black neveila Obama y’s lost seats during his midterms. Got it, dummy? You’re a tzevildevite chaya! How dare you you post such hateful and racist rhetoric?! Are you ok with people posting online about “this jew”? You can disagree with Obama, or even post your sentiment that he’s evil, but what chutzpah you have to use the “black” slur! What difference does his skin color make other than flat out racist generalization. Ugh! Obviously many here have chosen to forget the horrendous treatment of Obama by the Fox network and by Trump himself. What goes around comes around. What's good for the goose is good for the gander. Nothing against blacks but they didn't liberate you in Buchenwald. That's nonsense. And please don't find me the one anomaly of a black solider. It wasn't the norm. And us senate behimos increased in numbers . We will eat you alive. Historic victory for Trump! Never did a senate pick up seats at midterms. “ Obviously many here have chosen to forget the horrendous treatment of Obama by the Fox network and by Trump himself. 1) noone at Fox ever pushed away a wh staffer and a female. 2) They were not as nearly as provocative to his face in public like Acosta where you see the hate and they readiness for war before he started. Glad his pass was revoked. Unbecoming of a prestigous journalist. Why not make the point without the "black neveila" reference?